Mana is a powdered meal replacement (just like Queal) that was brought to my attention a few months ago. 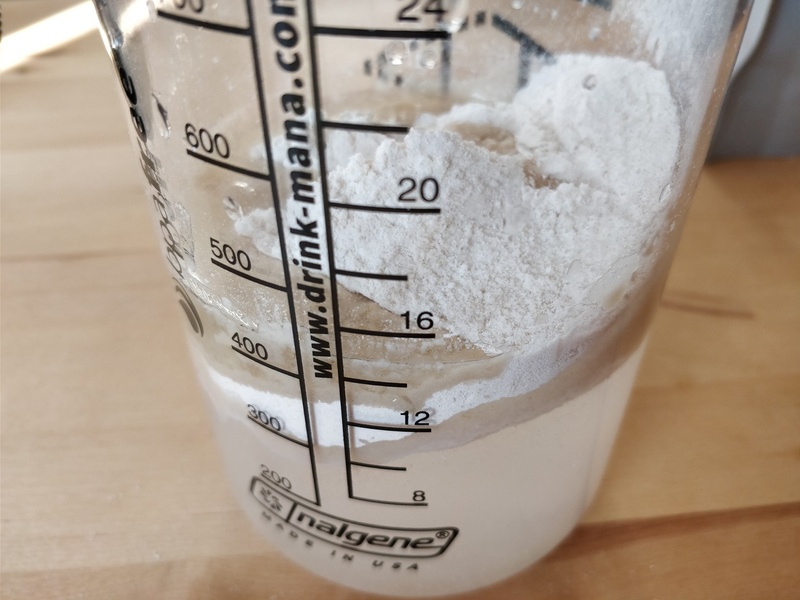 Having heard some really good things about it, I wanted to try it out, so I reached out to Mana and they were kind enough to provide me with two bags of the powdered version, a shaker, a measuring scoop, as well as two bottles of their premixed version, which was everything I needed for this review. Given the scepticism that often surrounds meal replacement powders, I’ll reiterate what I stated in my review of Queal: I don’t see products like these as a way to replace my whole diet. I see them more as a healthier alternative to the junk food I might order when I’m feeling lazy or the frozen pizza I might throw in the oven when I’m in a hurry. That doesn’t mean you can’t replace your whole diet with it; you probably can, but I would strongly recommend checking for any health implications this might have, as I’m not educated enough on this exact matter to provide a real opinion. As you may have noticed, there aren’t any animal products in Mana, making it suitable for everyone and probably a bit easier to digest. 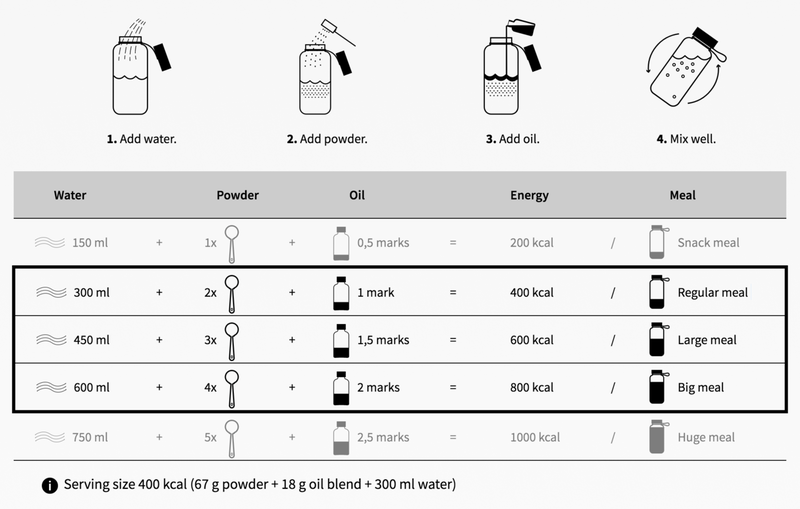 For the powdered version, preparation is fairly easy, with the added bonus of having a nice little chart to help you prepare the meal you want, instead of expecting you to have 3 meals with a single bag. Mana should really consider printing this chart directly on their bag; it would make preparation even easier. As shown in the chart, just add the required amounts of powder and oil to your water, shake, and you’re done. 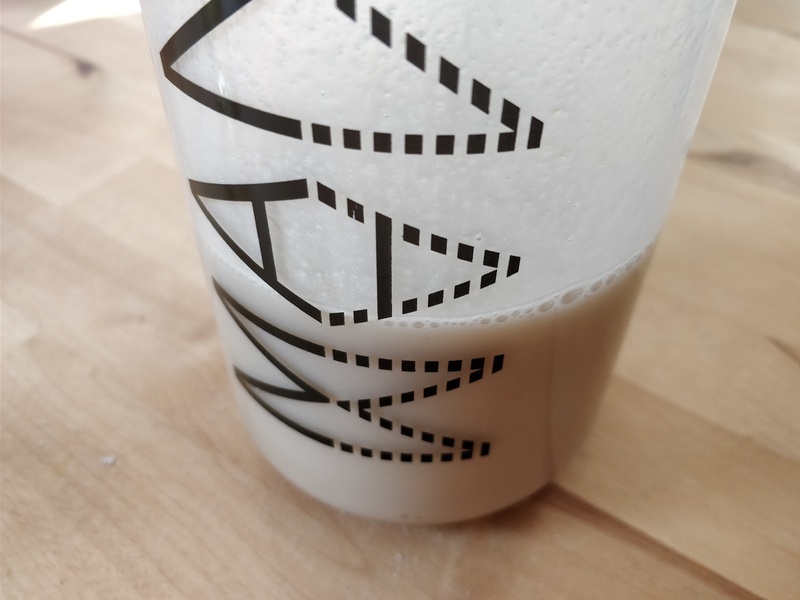 The resulting drink is really smooth, which actually surprised me given there isn’t anything mechanical to break up potential clusters of powder that may form. The powdered version tastes really great; something like vanilla porridge. It’s a really subtle taste that isn’t overpowering, without making Mana bland either. This means you can easily throw some fruit in there, as they suggest on their website. I wish I had a blender to try that out, but that’s something that’s still missing in my kitchen. I expected the premixed version to taste the same as the powdered one, given it has all of the same ingredients, minus the acacia sap and the HMB; it really didn’t. I’ll just quote my tasting notes here: “sort of like crab mixed with scallops with nutty hints and a subtle salty finish”. I’m not sure why it tastes so different, but what’s certain is that I had trouble finishing up, whereas with the powdered version I couldn’t get enough of it. I gave it another go a few days later, this time straight from the fridge instead of at room temperature; it somehow reversed the flavour intensities, having a nutty taste with some hints of crab and scallops, which made it slightly better, but it still tasted pretty bad to me. I’ve talked about the taste, but I haven’t addressed Mana’s main role yet, which is being a meal. 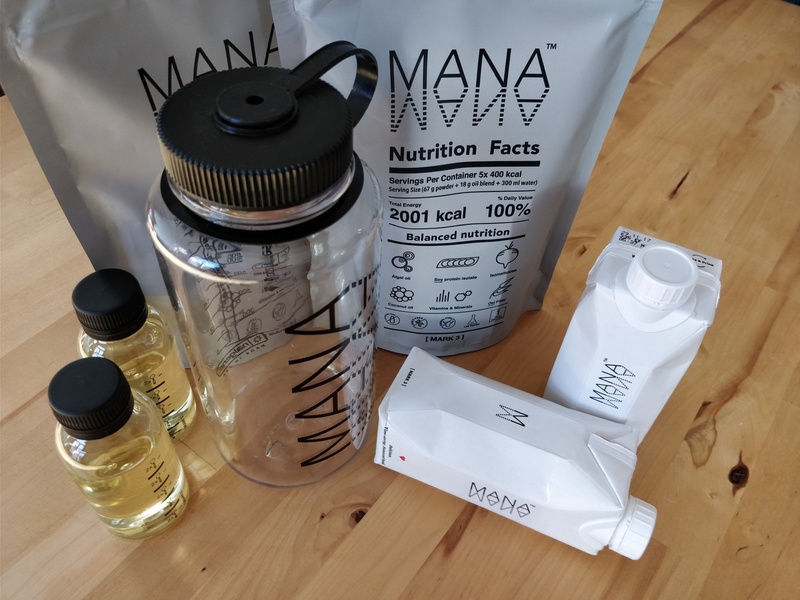 Mana gives me a nice feeling of fullness, without the big energy dip I often feel right after eating, which is really great. There is a bit of an energy dip, but it’s not nearly as much as what I get from regular meals. Regarding quantities, the standard 400 kcal size seems to be a perfect match for me. Other than that, their shaker is pretty great and easy to clean thanks to its large opening, but the cap needs some improvements. The band keeping it linked to the bottle makes it annoying, as it often swings in your face while you drink, unless you hold it in place. They could just get rid of the band, or perhaps make the cap one of those you can drink from directly, which would be even better. At €1.42 per meal, I will definitely be ordering more Mana in the future; just not the premixed kind… Maybe I should have accepted Mana’s initial proposal, which was to send me a full starter kit of 35 meals. If you want to check out Mana for yourself, have a look at their website. Mana: Powdered Meals With a Great Neutral Taste by Pierre-Louis Peeters is licensed under a Creative Commons Attribution 4.0 International License.